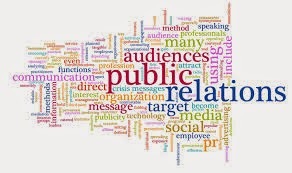 Public relations (PR) is the practice of managing the spread of information between an individual or an organization (such as a business, government agency, or a nonprofit organization) and the public. Public relations may include an organization or individual gaining exposure to their audiences using topics of public interest and news items that do not require direct payment. This differentiates it from advertising as a form of marketing communications. The aim of public relations is to inform the public, prospective customers, investors, partners, employees, and other stakeholders and ultimately persuade them maintain a certain view about the organization, its leadership, products, or of political decisions. Public relations professionals typically work for PR firms, businesses and companies, government, government agencies, and public officials as PIOs, and nongovernmental organizations and nonprofit organizations. Public relations specialists establish and maintain relationships with an organization's target audience, the media, and other opinion leaders. Common activities include designing communications campaigns, writing news releases and other content for news and feature articles, working with the press, arranging interviews for company spokespeople, writing speeches for company leaders, acting as organization's spokesperson by speaking in public and public officials, preparing clients forpress conferences, media interviews, and speeches, writing website and social media content, and facilitating internal/employee communication. Success in the field of public relations requires a deep understanding of the interests and concerns of each the client's many publics. The public relations professional must know how to effectively address those concerns using the most powerful tool of the public relations trade, which is publicity. Ivy Lee and Edward Louis Bernays established the first definition of public relations in the early 1900s as follows: "a management function, which tabulates public attitudes, defines the policies, procedures, and interests of an organization... followed by executing a program of action to earn public understanding and acceptance." However, when PR pioneer Ivy Lee was later asked about his role in a hearing with the United Transit Commission, he said "I have never been able to find a satisfactory phrase to describe what I do." In 1948, historian Eric Goldman noted that the definition of public relations in Webster's would be "disputed by both practitioners and critics in the field." "the art and social science of analyzing trends, predicting their consequences, counseling organizational leaders, and implementing planned programs of action, which will serve both the organization and the public interest."